Website templates bring a lot of power to the world of web design. They’re fast and easy to set up and get a site running in a matter of hours rather than days or weeks. They’re cheap in comparison to custom web design. They can still be highly customizable. Yet they all still have telltale signs of their template nature, which begs the question; can using templates hurt your site SEO? About ten years ago, there was this impression that if you wanted to have a website, it needed to have a truly unique design if it wanted to get anywhere on the web. This is the era where a lot of big name sites were founded in various styles. You have sites like Slashdot, with their minimalist news style. You have sites like Reddit, with their strange anti-forum threaded comments system. You have sites like Delicious, like Digg, and a whole lot more. In part, these sites grew and thrived because of their spearheading position in web content. In part, though, they thrived because of their unique web design and branding. Then, back in about 2013 or 2014, people started wondering if the value of a unique designed site was really still there. Many unique sites were being panned; sites with experimental Flash-based layouts, sites with horizontal rather than vertical content presentation, and others. When these failed, while sites running on templates – like the entire Gawker Media empire prior to its fall – thrived, people started to talk about the death of custom web design. You can still see the arguments they made, and I’m not talking just any old small marketers; big names like Moz were discussing it. This is an indication of the current trend of a more template-based internet. The thing is, templates work just fine. Back in the early days, it was understandable to want a unique web design. These days, though, there are so many unique templates, with so many potential customization options, that it’s often difficult to tell what’s a template and what isn’t. Google doesn’t care if a site is based on a template or if it uses unique web design, at least not outwardly. They, as you might expect, have broken the issue down into many smaller, core issues, and focus more on those. To Google, user experience is king. Site speed is important. Mobile compatibility is important. Copied content and branding are important. These are elements that can be positive or negative for either type of site, both template and unique design. So, no, outwardly Google isn’t going to penalize a site for using a template, nor are they going to penalize you for not using one. However, they can penalize you for a lot of things that can be solved by using a template, or a lot of problems that can come up with using a template. There are, as I mentioned, a lot of potential downsides to using template sites. Foremost among them is choosing the wrong templates. There are probably millions of templates, themes, and skins for website frameworks out there. 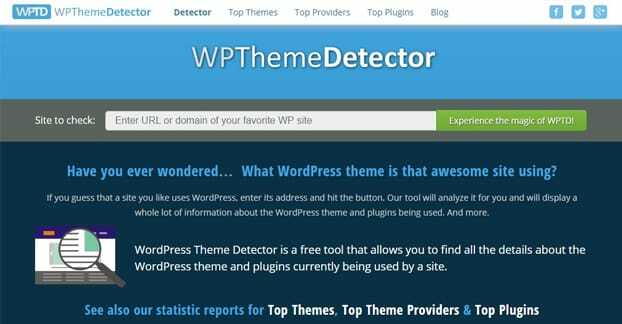 Just thinking of WordPress alone, there are numerous large databases dedicated specifically to themes, both free and paid. However, when you narrow down the purpose of your site, your budget, and your color scheme, you start to see a lot fewer templates on offer. Among those, it’s relatively likely that you’re choosing something someone else has chosen as well. Now, this isn’t necessarily a problem. Unless the other site picking the template is a direct competitor, you might not even share a smidge of the same audience. What does it matter if two sites look the same, if no one sees both of them? However, you might run into an issue with the template being frequently chosen for spam sites. For example, there are thousands of thin affiliate microsites available on the web, and there are some large tutorials on how to set them up. Often, these tutorials will be laced with affiliate links themselves, for web hosting, for plugins, and for themes. If 10,000 people follow that guide and use the specific theme called out by the tutorial, that’s 10,000 low quality sites all using the same theme, likely with few if any customizations. If you then choose to use the same theme, regardless of the quality of your site, you might take a hit because you look like all these other sites that aren’t very good. Now, Google isn’t likely to hurt you directly for using the same theme as a spam site, or even as a swarm of spam sites. However, they might give you slightly less trust, which means you have less benefit of the doubt if you do something gray hat. More importantly, though, users who have come across those thin spam sites might associate you with them. They’ll give you significantly less trust, and many of them will recognize the general format of the site and leave immediately, knowing from experience that a site that looks like yours is unlikely to have anything of value. You can of course alleviate this problem by doing some research into the theme, how many users are using it, and what kind of content they’re providing. You can also customize the theme more, so it’s more unique in appearance. Another more modern concern is that of strong branding. Google recently pushed an update cheekily named Fred, which hurts a lot of high-ad low-content sites, and one of the primary factors they use to determine the quality of such a site is their visual branding. Sites that don’t have a strong appearance, a memorable branding, and a robust feel to them are more likely to take a hit. This can be avoided by using more visual media and commissioning a good logo, but that’s still investment and money that many people don’t want to provide. Finally, templates have one major issue, which is that there are thousands of them but there’s not much way to see how old and how compatible they are. You could be looking at a good template that uses outdated code, leaves you open to a security vulnerability, or has other issues. Primarily among these is mobile compatibility. Google takes mobile very seriously these days, and sites that don’t have mobile visibility are being demoted more and more heavily as time goes on. This is not to say that a custom design is free of problems either. It’s entirely possible for a custom design to lack many of these features or have many of these problems as well. Now, obviously, the foremost problem with using custom web design is that it’s a completely custom design. This means you need to workshop it with a designer, you need to spend time with the back-and-forth play of adjusting it to be just right, and you have to pay a significant premium for that design. Web design is very much one of those “cheap, fast, good; choose two” products. Cheap and fast web design is going to be poorly done. Cheap and good web design is going to take a long time to produce. Good and fast web design is going to be very expensive. There’s also the issue that custom web design requires an eye for design or the willingness to leave it in the hands of the designer. You don’t necessarily know what makes a site good, just what you like in a site, which isn’t necessarily reflective of broader practices. Web designers will implement what you want so long as you’re paying them, and some of them might not warn you when you’re going against some best practice or another. Many simply no longer feel the fight is worth it. Just look through Clients From Hell for stories from freelancers who have to deal with people who think they’re right when they don’t know what they’re talking about. Custom design isn’t necessarily good design, either. A web designer might not really know what they’re doing, or they might use out of date practices. 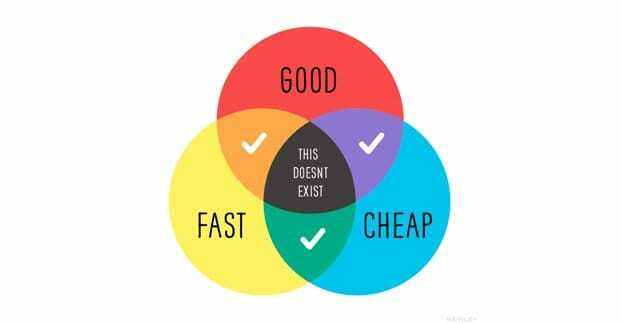 This is particularly prevalent with older designers who haven’t followed up with modern trends. They tend to charge low rates because they can’t do what a lot of modern sites need, or they do it in a way that leaves the site very slow and lagging behind modern web speeds. It wasn’t a problem when connections were dial-up and DSL, but with cable and fiber it’s extremely noticeable, and Google takes site speed into consideration for SEO. Sure, templates can be slow as well, but many of them are built for speed, and it’s more likely that plugins slow a site than the template. Custom web design is also often quite expensive. When you can get WordPress for free, get a $10 hosting package, get a $7 theme, a few $5 plugins, and have a site up and running in a few hours, it’s hard to justify spending $300 an hour on web design with a 30 hour minimum. 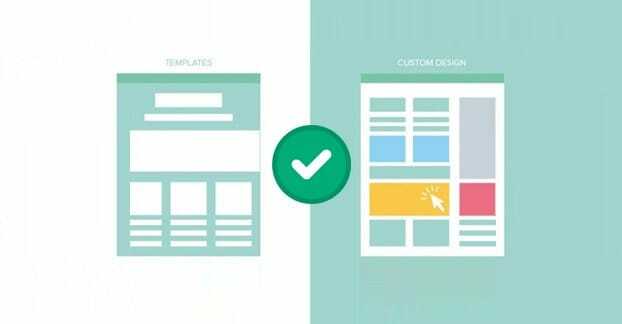 At the end of the day, does it really matter whether your site is template-based or a completely custom architecture or design? Well, the answer is generally no. There are some exceptions. 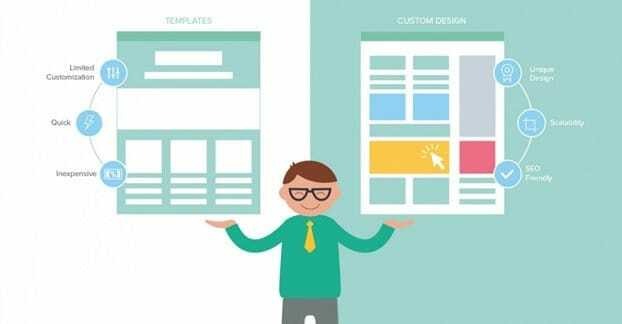 Template-based designs on the very low end, such as those drag-and-drop web editors for hosts like Wix or Squarespace, can end up with lower SEO than other sites. However, this is generally because of the URL, which you can usually customize. Mid and high-end template designs, like WordPress and the Genesis framework, work much better. Meanwhile, custom design is generally fine, so long as it’s up to modern web best practices and it’s not trying something experimental in a way that’s harmful to the user experience. A completely animated site in Flash would look cool if a good artist did it, but it’s also impenetrable by the Google spiders, so it might as well not exist. 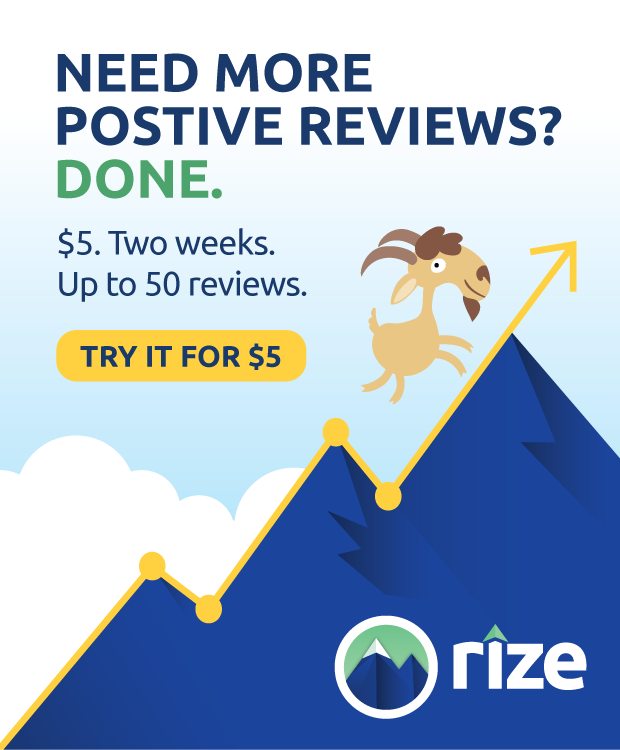 Really, though, if I gave you a list of ten different sites, would you be able to tell me if they use templates or if they have completely custom designs? You can probably recognize a stock blogger.com layout or a Wikimedia design, but did you know that The New Yorker, The Jane Goodall Institute, and even Sony Music are all powered by WordPress? Realistically, most web users won’t be able to tell the difference between a slightly customized or niche WordPress template and a completely custom design, unless the custom design is completely off the wall. I myself can’t even tell the different a lot of times, though I’m aware of tools that allow me to look up the architecture of a site and see what kinds of plugins, structure, and framework they’re using, if any. Web design is relatively homogenous these days. Standing out in terms of design doesn’t really get you anywhere, since Google rates sites based on the ability of a user to navigate them, and users want navigation structures they’re used to seeing. This is why you so rarely see sites with navigation on the right side, or horizontal sites, or other unexpected options. The moral of the story is to do whatever allows you to best create a solid user experience with a site that meets the main design focuses of Google; fast speed, a design that adapts to mobile, a front and center presentation of content, and minimal obstruction of the user experience. If that takes custom design in your book, and you can pay for good design, so be it. If you can find a good template and brand it to work for you, more power to you.